HOK also did the new Northwest Arkansas ballpark. Kind of a cool park. It definitely does not follow the retro trend. I went to a ball game there a couple of weeks ago. It is indeed a nice ballpark, but is currently in the middle of nowhere. That is sure to change soon though. Ah yes, Arvest Ballpark....the BOk of NWA. I see a definite trend developing. And Inteller, if you don't like QT and BOk sponsoring everything you could step up. Ye ole' put up or shut up routine. But thanks again for your helpful input. "I hate Bok." - Inteller in Grumpy Smurf's voice. I can't figure out how you've survived to middle age being this unhappy. Figured you would have ended it by now. I was at (current) Drillers Stadium for the fireworks on the 3rd. There probably 10,000 people in the stands. It was really crowded in the concourses--no question why Chuck wants more space for people to hang out. Kind of a shame the footprint and overall seating capacity is going to be so much smaller, though. I ran into one of the people involved in the new one and voiced that concern, and his response was basically, there's something to be said for a ticket that's hard to get--creates buzz and demand. I guess I understand that, but given the additional draw of a new venue downtown, seems like they could have shrunk it from 11,700 to 8,200 and been just fine, and it wouldn't sound so small. It's not like you can cram people into berm seating . . . anyway, that's really my only complaint. I went to the Drillers game on Saturday for the free baseball card sets. It was also 50 cent hotdog night. I saw cannon fodder (and cannon mudder and cannon family) there. There is something special about a baseball game. My kids would never watch a single inning of a game on television, but don't want to leave the games at Driller Stadium. We have been to about a dozen games together this season (and me a few more without them) and I have to say they have all been great. Some of the best parts is running into all the people you know and meeting new folks as well. 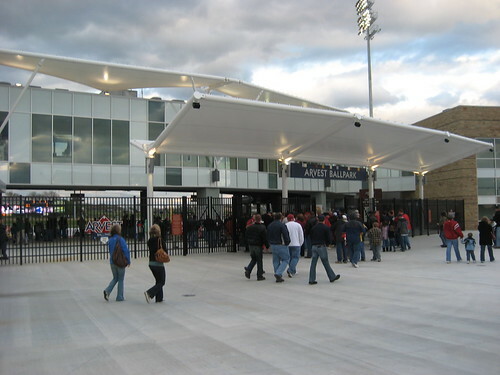 The ballpark is a great community gathering place. We are probably going back Tuesday night for Two Dollar Tuesdays. Where else can a family have so much fun for so little cash? Thursday the 15th is free ticket night from Reasor's and two weeks later is free ticket night from Arby's. While I have the zeal for a large stadium, I'd say smaller is a better way to go. Just like TU football, the odd large crowd game is not worth the extra expense of construction. The Driller's have many more games under 4K than over 8500 (estimated capacity with berm). The overall atmosphere will be much better with the small stadium. 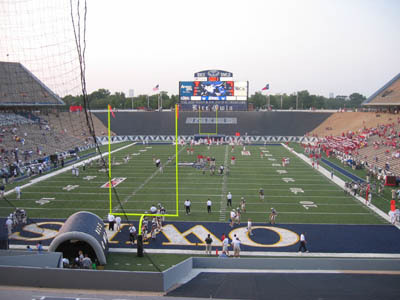 Like Tulsa Football, I hope we have the problem of "where to put more seating" instead of worrying about having an empty stadium (see, e.g., Rice). Few things are sadder in athletics than an empty stadium. Side note: I happened to sit right next to RM and didn't notice him. We caught up on our gossip and traded stadium opinions. A good time was had by all. I just don't think anyone is taking into account the renewed enthusiasm a new stadium will bring. As we've discussed, it's not the team itself that brings the fans--it's the ballpark experience that RM describes. I don't know how much the 89er/Redhawk attendance jumped when the team moved to downtown OKC, but I'm thinking it was about 25%. I'm not trying to second-guess Lamson, but I really think Tulsa will fill a lot more seats than it does now, once those seats are downtown. Also - I doubt they'll be able to cram 2200 people into berm seating. It's just hard to get folks to sit right up against each other on grass. But I guess we'll find out. Anybody know what is being provided in the way of accomodating long-term expansion? The new stadium will also have lots of luxury boxes. Those should be easy sales to downtown businesses wanting to intertain. The current ballpark only has a few. They hold sixteen people each and go for 800 bucks. You get your own menu of everything in the ballpark and a waitress every inning. It is like having a nine course meal. Start with some peanuts and cracker jack, hit the brats or philly steaks in the middle and then close the game with a couple of different ice creams or cotton candy. It also includes your own keg of beer. I heard the new stadium was going to shoot for 32 luxury boxes. Floyd, I believe the berm seating reflects the "hang out" crowd also. As you suggested, many people go and just hang out. So the availability of "seating" may not be that big of a concern (RM pointed out the same with the OU/OSU game). Also, a 25% jump will see ~5500 per game. Still leaving seats open at most games. At the games that are sold out, and then standing room only... it could actually be a hot ticket. Encouraging season tickets, advanced sales, and other positives for the club. But I am curious on the possibility of expansion. Always wise to at least consider it. FYI, the AT&T Bricktown Ballpark seats 13,000 and is usually at just 60% capacity. Even with good attendance (7700, 8th best in minors) the stadium looks empty most game days. I guess I'd rather have a stadium a little too small and seem overly busy, than the other way. The current stadium is generally regarded as being too large. It's the largest in Double A ball, if memory serves me correctly. A stadium with 6500 permanent seats plus room for +/- 2000 more in the berm seating sounds just about right to me, especially with the additional luxury suites, party deck, kids playground, picnic area overlooking the field, etc. Yeah, I know. I actually worked there for several summers pitching peanuts and schlepping cokes in the stands. 11700 is generally too much. I think I'm just skeptical of the berm seating. I'd vote for bleachers instead. Also, I understand it's actually an issue of footprint size--the Archer and Elgin site simply limits how many seats can go in. My main fear is still that they're building too small. I wonder if Bedlam baseball will continue to play a game in Tulsa, and I know that the Big 12 tournament is out of the question. Still, I drove the area over the weekend, as did some late-night sampling at Tiny Lounge (freakin' great patio) and Arnie's (forgot what a great pub that was). It's going to be fun--can't belive it's only two years off!